Passing Death and Glory at Belaugh I fell to thinking about Arthur Ransom's Coot Club. The Hulabaloos are still around on the Broads. Big cruisers power their way up the narrow River Ant, a bit late for their handover at Stalham. Other do not make it: VIDEO: Cruiser gets stuck under bridge on Norfolk Broads - YBW. There is always a danger that tourism can destroy the ecosystem on which it depends. Too many big high powered cruisers charging from pub to pub will degrade Britains Magical Waterland. 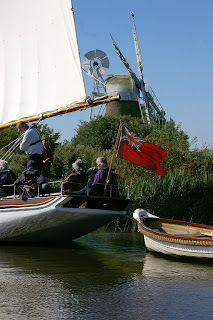 Observe holiday makers on the Broads - there are a lot who are identifying with our British seafaring heritage - OK maybe pirates do not quite fit the bill - but there are lots of them. How strange to find a Mississippi stern wheeler.. Steam boats, traditional sailing boats and the deep England churches and thatched cottages in the landscape don't seem to clash in the same way. What bells might they ring with the Black Asian and Minority Ethnic (BLAME) communities?